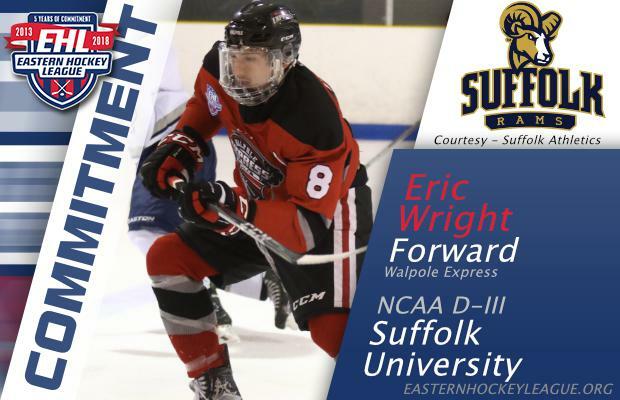 WALPOLE, MA -- Eric Wright, a forward for the Walpole Express, has committed to Suffolk University for the Fall of 2018. After spending the 2015-16 season playing for the Express in the Eastern Hockey League Premier (EHLP), the '97 transitioned well to the Eastern Hockey League (EHL) level, putting together back-to-back solid years. While his 2016-17 season was cut a little short due to injury, Wright bounced back this past year and finished his junior career with 50 points in 76 career games in the EHL. "Eric had a great junior hockey career with the Express and we are excited to see him make the jump to NCAA hockey next season," said Express head coach and general manager Jon Lounsbury. "His passion for the game and compete level are his best asset to help him make an impact next season at Suffolk. There is no doubt in my mind that Eric will have a great college career playing in the NEHC." A few seasons ago at the EHLP level (2015-16 campaign), the California native led his team in scoring with 67 points in 41 regular season games. Wright then added to his totals with a goal and five assists in three playoff games. Wright is very excited about his future, and also extremely thankful to all those who helped make it possible. "I want to thank the Walpole Express, especially Coach Lounsbury and Coach Polino, for helping me get to where I am today," said Wright. "I also want to thank my family for all of their support over the years."